To interact with the original forum post for this discussion, click here. Hi! Ready to talk about homeschooling your only child? Or maybe you have a houseful and you're just curious as to what we do with our 'onlies' all day. First, let me introduce myself - I'm Tonia and I'm homeschooling one daughter - TJ. She's 11, in 6th grade, and she's never been inside a classroom - homeschooled since birth! I hear lots of positive (and negative) assumptions about homeschooling in general and even more about homeschooling an only. But I'd like to start on a positive note - so let's talk about the advantages of homeschooling an only. What do you love about homeschooling your only child? Or, if you have more than one - what do you perceive are the advantages of homeschooling an only? Click here to interact with the original forum post. You would think homeschooling your second-born would be a given if you are homeschooling your first, right? But even though the special needs of my oldest had necessitated him getting his education at home, I didn’t really consider it for my active, happy five year old (who I’ll call “P”). Yes, he was quite speech-delayed, but he had a lot of ear infection troubles as a toddler, and our ped always attributed the delay to that. So with speech therapy and a half-day kindergarten program, we felt like we were right on track with P.
Only three weeks into the school year, P became lost on a school field trip. He had simply wandered off from the group - - something we had dealt with multiple times in the past, and had again attributed to simple causes. Thankfully, he turned up just down the road from his group, but a couple months into the school year, the speech delays just weren’t improving much, and P was getting frustrated at not being able to communicate well with his peers and teachers. And following Christmas, we were having an unexpected sit-down with the school therapist who felt at the minimum he was likely to have dyslexia, and at the maximum, well...just might be on the Autism Spectrum. To interact with Becky on the original forum post, click here. I'm Becky, mom of 5 kiddos through adoption, foster, and birth. Because we have such a mixture of cultures in our house (China, Ethiopia, Mexico, US) I began to look for ways to celebrate our heritages and learn about world celebrations, cuisine, etc. 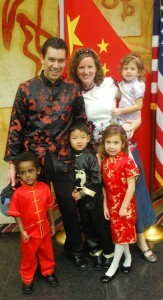 I founded KidWorldCitizen.org initially to share ideas with other multicultural and adoptive families. It grew and grew, and now I am happy to share ideas with families and teachers to help kids learn about all world cultures and geography. The most common question I get is "How can my kids learn about the world when we don't have the opportunity to travel? "....or "when we live in a homogenous community?" Between libraries and the internet there are hundreds of ways we can connect to the world! Here are 10 ways you can incorporate culture TODAY into your children's lives- but this is not an exhaustive list! Please add your comments and share ways you learn about the world in your family . * read books that defy stereotypes by showing more than one side of the story. When studying "Africa," for example, choose a specific country instead of an entire continent. Pick stories from rural and urban settings, in the past and the present, folktales and nonfiction. Often times Africa as a continent is portrayed as vast rural stretches of land with abundant wildlife (which does exist, but is not the whole story). There is a danger to a single perspective or stereotype, and kids should not be surprised to learn about bustling cities, where families live, work, and go to school. These stories show some of the kids who live in South Africa’s different areas and lifestyles..
* join the Global Read Aloud. This world-wide book club uses Twitter, Skype, Edmodo, their wiki, email, regular mail, Kidblog, Tackk, and any other tools you can think of to make connections and discuss the book. There are several books to choose from, and kids in kindergarten through college can participate! Searching out restaurants and supermarkets from different cultures has double the benefits: not only will you be exposing her to diverse ingredients and flavors, you also will meet people who the culture. Cook cuisine from around the world with your kids. Aside from dinner, try to find breads, typical snacks or breakfast foods- or desserts! 3) Become part of the community. Community centers are gathering places in the local community for many ethnic groups and immigrants. We have been welcomed into our local Ethiopian church, who recently invited adoptive families to their Easter feast. The outdoor buffet was brimming with injera and different kinds of wot, and crowds of kids were running around playing basketball, soccer, and visiting the face-painting clown. Our Children's Museum frequently hosts cultural groups and we have made Turkish marbled paper with the Turkish community, and Norwegian hearts at Christmastime. For Chinese New Year, the Chinese Consulate opens their doors for the celebration: dancers, music, games (how many grains of rice can you pick up with chopsticks?) copious amounts of food, and a gallery of photos from China. I have heard parents express their discomfort at being in the minority at such events: step out of your comfort zones and surround yourself with the new culture. 4) Celebrate! Learn about traditions and customs for festivals, celebrations, holidays, birthdays and select some favorites to celebrate. Start small: research the holidays and find out where the closest celebration is. If possible, attend the event, parade, or party as a family. If there is nothing close-by, re-create it in your home: watch clips on youtube, talk to friends of the same culture to gather details, research it on-line to learn more. Don't stop at home- bring the celebrations to your co-op-- who doesn't love a reason to party? Here's an example lesson plan that I created for preK- elementary school for Chinese New Year.